ELCA congregations of Racine will come together on Sunday, September 13 for worship and service. We’ll start the day doing various community service projects around Racine, wearing our bright gold “God’s Work, Our Hands” t-shirts. 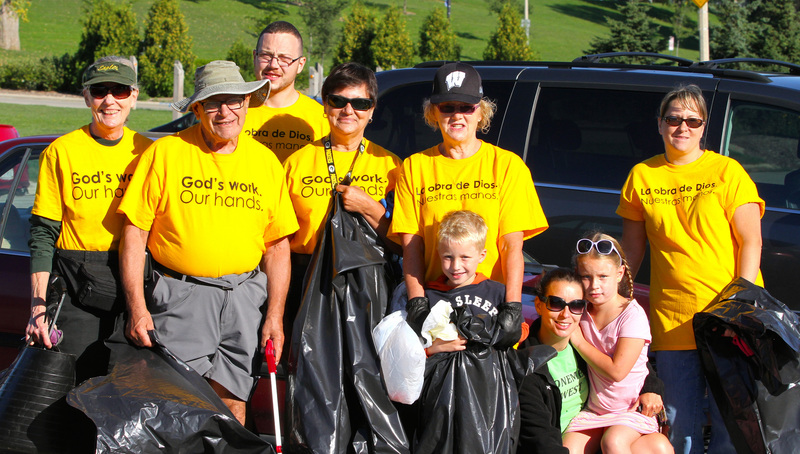 Whether it’s cleaning up a public park or volunteering at a homeless shelter, service activities offer an opportunity for us to explore one of our most basic convictions as Lutherans: That all of life in Jesus Christ – every act of service, in every daily calling, in every corner of life – flows freely from a living, daring confidence in God’s grace. If you haven’t signed up for a service team, talk to Art Smith. Then we’ll gather at Lutheran Church of the Resurrection, 322 Ohio Street, for a joint worship service at 11:30. Please bring lawn chairs if you can. Envelope offerings will be returned to the individual congregations; 50% of loose offerings will go to Outreach for Hope; the other 50% will be divided among our various food ministries. After worship, you’re invited to stay for a cookout and an afternoon of kids’ games and other entertainment. Hamburgers, hot dogs, brats and portabella mushrooms will be served. Please bring your favorite salad, side dish or dessert to share. Giant Jenga, Giant Kerplunk and other fun games will keep the young – and young at heart – entertained. Note: there is a back entrance to Resurrection as well as the main entrance from Ohio Street. To enter off of Hwy 31: Turn east on Ridgeway Avenue, then south on Perry Avenue (which leads into the parking lot.). To enter off of Ohio Street: Turn west onto Westway Ave., then south on Perry Avenue.